Today I have good news and bad news. You’d like to hear the good news first? OK. The bad news is that AutoAdministrator is being retired and will no longer be developed. OK, now on to the good news. AutoAdministrator is of course not entirely history and is undergoing a similar transformation the NTToolkit did a few years back. AutoAdministrator is joining the “EventSentry” brand as the “EventSentry Admin Assistant”. The last enhancement is particularly useful if you need to check whether a particular Windows update is installed on your network – see the screenshot below. Please note that there is no upgrade path from AutoAdministrator to the EventSentry Admin Assistant – they are treated as separate pieces of software and will install side-by-side. 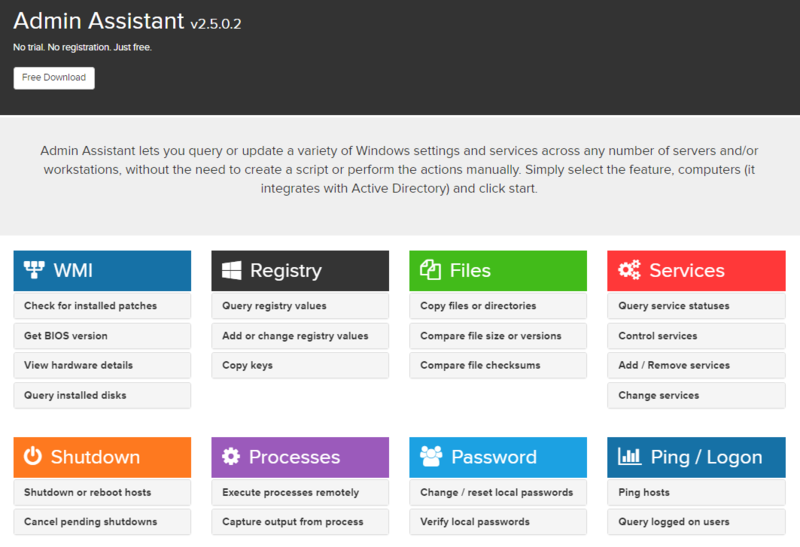 You can download the latest version the EventSentry Admin Assistant here. The debate as to whether agent-based or agent-less monitoring is “better” has been answered many times over the years in magazine / online articles, blog posts, vendor white papers and others. Unfortunately, most of these articles are often incomplete, inaccurate, biased, or a combination thereof. To make things slightly more confusing, different ISV use different methods for monitoring servers and workstations. Some use agents, some don’t, and a small few offer both both methods. But what is ultimately the best method? First it’s important determine what is being monitored to determine whether an agent-based or agent-less approach is better. For example, collecting system metrics like performance data usually creates fewer challenges then transmitting large amounts of (event) log data. Furthermore, agent-based monitoring is not an option for devices which run a proprietary embedded OS (think switch, printer, …) where you can’t install an agent in the first place. Consequently I’ll be focusing on monitoring (event) logs with an emphasis on Microsoft Windows in this post. Having developed both agent-based as well as agent-less components in C++ over the years I feel that I am in a good position to objectively compare agent-based with agent-less approaches. 1. Security: Better security since agents push data to a central component, instead of the monitored server being configured to allow remote collection. 2. Reliability: Agents can temporarily store and cache monitored logs if connectivity to the central monitoring server is lost, even if local logs are no longer available. Agents can also take corrective actions more quickly because they can work in isolation (offline). Mobile devices cannot be monitored with agent-less solutions since they cannot be reached by the central monitoring component. 3. Performance: Agents can apply local filtering rules and only transmit data which is valuable, thus increasing throughput while decreasing network utilization. 4. Functionality: They offer more capabilities since there are essentially no limits as to what type of information can be gathered by an agent since it has full access to the monitored system. The irony, when promoting a solution as agent-less, is that even so-called agent-less solutions do in fact utilize and agent – the only difference being that the agent is (usually) integrated into Windows. Windows doesn’t just magically service remote clients asking for a boatload of WMI data – it processes these requests through the WMI service, which, for all intents and purposes, is an agent. For example, accessing the Windows event logs via WMI traverses significantly more layers than accessing the event logs directly. With the exception of network devices where an agent cannot be installed, agent-based solutions will provide a more thorough monitoring experience 9 out of 10 times – assuming that the agent meets all the checklist requirements below. Some event log monitoring vendors will try to convince you that agent-less monitoring is better & easier (easier for whom?) – but don’t fall for it. We’ve been tweaking and improving the EventSentry agent for more than 10 years, and as a result EventSentry offers one of the most advanced and efficient Windows agents for log monitoring on the market. Developing a rock-solid, secure and fast agent is hard, but it’s the only sensible approach which doesn’t cut corners. There are situations when deploying a full-scale monitoring solution with agents is not possible, for example when you are tasked with monitoring a third-party network where installing any software is not an option. While unfortunate, an agent-less monitoring solution can fill the gap in this case. EventSentry also utilizes SNMP (agent-less) to gather inventory, performance metrics as well as other system data from non-Windows devices, including Linux hosts. This collection method does suffer from the above limitations, but since log data is pushed from Non-Windows devices via the Syslog protocol, it’s an acceptable compromise. Don’t compromise when it comes to monitoring the (event) logs of your Windows infrastructure and select an architecture which scales and offers security & performance. The table below examines the difference between agent-based and agent-less solutions in greater detail. Usually higher throughput since agents can analyze, filter and evaluate log entries before sending them across the network. Local resource utilization depends on the implementation of the agent. Agent can access (event) logs directly via efficient API access. Network utilization is likely much higher since more logs have to be transmitted across the network before being evaluated. Local filtering capabilities are limited and depend on the protocol (usually WMI). Network latency and utilization affect performance of monitoring solution. Network utilization cannot be controlled. Accessing (event) log data remotely through WMI is much less efficient. Over-saturation of central monitoring component can negatively affect monitoring of entire infrastructure. Higher network utilization combined with the fact that remote log collection will still utilize CPU cycles on the remote host (e.g. through WMI provider) favors agent-based solutions. Agent-less solutions have a single point of failure, while agents can filter & evaluate data locally before transmitting them to a central database. EventSentry Agents are designed to be essentially invisible under normal operations and do not impact the host system negatively in any way. Failure of an agent does not affect monitoring of other hosts. Locally collected data can be cached if central monitoring component is temporarily unavailable. Failure of a central component may negatively affect deployed agents if they rely on the central component and cannot cache data. Failure of central monitoring system will affect and potentially disable monitoring of all hosts. Hosts which lose network connectivity (e.g. laptops) cannot be monitored while unreachable. Agent-based solutions have an advantage since local data can be cached and corrective actions can be executed even when the central monitoring component is unavailable. Cache data & logs are re-transmitted – even if the local logs have been cleared or overwritten. Agent-based solutions can monitor hosts even when disconnected from LAN. 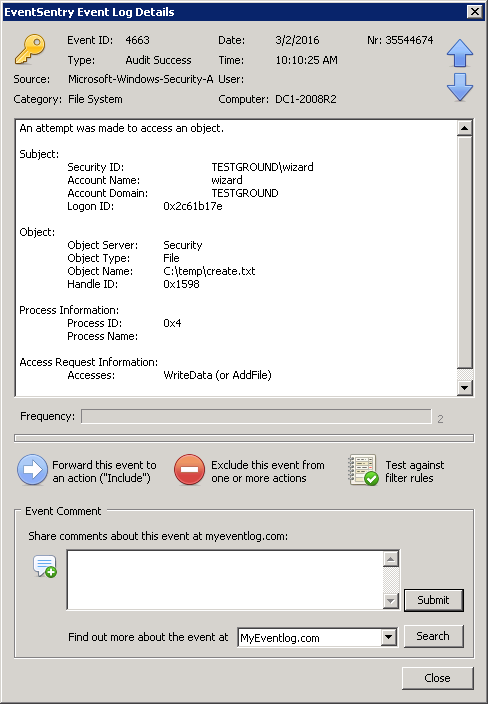 The EventSentry Agent auto-recovers if the process aborts unexpectedly, and by default alerts the user when this occurs. When using the collector (default), the agent caches all data locally and retransmits when the network connection becomes available again. Has to be deployed either with vendor management software and/or with third-party deployment software if vendor provides installation package (e.g. MSI). Larger deployments will require multiple central monitoring components, potentially distributed over several LANs. Only hosts in local LAN can be monitored. Depends on deployment tools made available by vendor as well as management tools in place for configuring Windows settings. A poorly developed deployment tool would favor an agent-less solution. EventSentry Agents can be deployed (multi-threaded) with the management console or through 3rd party deployment software by creating a MSI installer on the fly. When using the collector (default), agent updates (patches) can be deployed automatically. Depends on whether the mechanism utilized by the monitoring software requires a Windows component to be added and/or configured. Depends on whether agent has dependencies and whether configuration changes need to be made on the monitored hosts. The EventSentry Agent does not depend on any 3rd party frameworks or libraries. Potential security issues if installed agent exposes itself to the network (if not firewalled) and/or suffers from local vulnerabilities which can be exploited. Remote log collection has to be enabled and at least the central monitoring component needs to have remote access. Secure data transmission relies on protocols and settings from Windows. Enabling multiple methods for gathering data remotely (e.g. WMI) provides additional attack vectors. Credentials (usually Windows user/password) for remote systems must be stored in a central location so that the remote hosts can be queried. If the central system gets compromised, critical credentials can be exploited. Since agent-based solutions do not require permanent remote access and monitored hosts can therefore be hardened more, they are inherently more secure IF the agent doesn’t suffer from an insecure design and/or vulnerabilities. Agent-based solutions also have more control over how data is transmitted from the remote hosts. 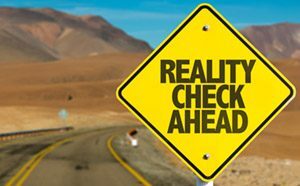 If there is general concern against third-party software then the product in question should be researched in a vulnerability database like http://www.cvedetails.com. The EventSentry Agent does not open any ports on a monitored host and resides in a secured location on disk. The agent transmits compressed data securely via TLS to the collector. No major security vulnerabilities have been discovered in the EventSentry agent since its first release in 2002. Agent-less solutions are limited to remote APIs provided by the monitored host, most commonly WMI. While WMI does offer a lot of functionality, there are limitations. Executing scripts on remote host is more involved and only possible when host is reachable. Agent-based solutions have an advantage since they can utilize multiple technologies to obtain data, including highly efficient direct API access. Agents can also trigger (corrective) actions locally even while the agent is unreachable. Agent-less solutions can only monitor data which is made available by the remote protocol. The EventSentry Agent accesses log files, event logs and other system health data almost exclusively via direct API calls. 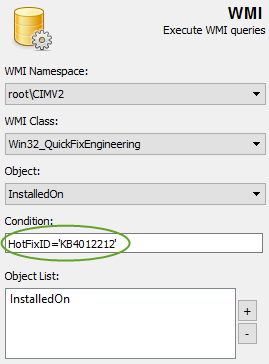 The more resource-intensive WMI interface is only used minimally, for very specific purposes. Corrective action can be taken directly on the monitored host, often only in milliseconds after an error condition (event) has occurred. When evaluating software that offers agents then you can utilize the check list below for evaluation purposes. An agent needs to consume as little resources as possible under normal operations. 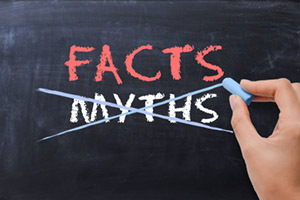 With the exception of short (and unusual) peak periods, a user should never know that an agent is running on their server or workstation – period. The thought of having a resource-hogging agent running on a server sends shivers down the backs of many SysAdmins, and the agents used by certain AntiVirus vendors that rhyme with Taffy didn’t set a good precedent. The agent needs to run at all times without crashing – the SysAdmin needs to be able to go to sleep knowing that his agents will reliably monitor all servers and workstations. Unstable agents are just no fun, especially when they negatively impact the host OS. If an agent that encounters an issue, it needs to at least auto-recover and communicate the issue to the admin. Agent deployment and management needs to be streamlined and easy – it shouldn’t be a burden on the end user. And while agent deployment is important, agent management, keeping the remote agent up-to-date, is equally important and should – ideally – be handled automatically. Most SysAdmins have enough work the way it is, the last thing they need is baby-sitting agents of their monitoring solution. The more dependencies an agent has, the more difficult it is to deploy the agent. Agents that rely on complex frameworks like .NET, Java or specific Visual Studio runtimes are difficult and time-consuming to deploy. Furthermore, any third-party software that is installed as a dependency creates an additional attack vector and needs to then be kept up-to-date. An agent needs to be 100% secure and cannot expose the monitored host to any additional security risks. I will explain below why using agents is actually more secure than not using an agent – even though this seems counter-intuitive at first glance. Remote Support with VNC – The Easy & Secure Way! Almost everyone in IT has heard of VNC – which actually stands for “Virtual Network Computing”. The RFB (Remote Framebuffer) protocol which VNC relies on, was developed around 1998 by Olivetti & Oracle Research Labs. Olivetti (unlike Oracle) isn’t much known outside of Italy/Europe, and the ORL was ultimately closed in 2002 after being acquired by AT&T. But enough of the history. When the need arises to remotely log into a (Windows) host on the network, Microsoft’s Remote Desktop application (which utilizes Microsoft’s RDP protocol – not RFB) is usually the default choice. And why wouldn’t it be? It’s built into Windows, there is no additional cost, and it’s usually quite efficient (=fast) – even over slower connections. We set out to solve these shortcomings by creating a number of scripts around UltraVNC that integrate with the EventSentry management console (although they’ll work well without EventSentry as well!). Using the QuickTools feature, you can then connect to a remote host via VNC with 2 clicks, even if the remote host doesn’t have VNC installed. Important: The scripts only work in environments where you have administrative access to the remote hosts. The scripts need to copy files to the remote host’s administrative shares and control the remote VNC service. Even better, VNC can be automatically stopped and deactivated (until vnc_start.bat is run again) once the session is completed in order to reduce the attack surface. As long as you have administrative access to the remote host(s), the script will remotely install VNC and even setup a firewall exclusion rule if necessary – although the UltraVNC installer takes care of this out of the box. To reduce the attack surface of machines running VNC you can automatically stop the VNC service after you have disconnected from the remote host. Our connection script will automatically start the remote service again when you connect the next time. For the utmost security you can also completely uninstall VNC when you are done, a script (vnc_uninstall.bat) is included for this purpose. Even though VNC is generally not as fast as RDP, it’s usually sufficiently fast in LAN environments (especially for shorter trouble-shooting sessions) and the UltraVNC port which we’ll be covering in this post performs reasonably well even over slower WAN connections. Remote desktop sharing is an additional benefit with the UltraVNC package which is included with the latest version of EventSentry (v3.3.1.42). Customizing the scripts and integrating them with EventSentry literally shouldn’t take more than 5 minutes, and once setup & configured will allow you to remotely control any monitored host with a couple of clicks. The scripts do not require EventSentry, but are included with the setup and integrate seamlessly into the EventSentry Management Console. The EventSentry Management Console includes the “QuickTools” feature which allows you to link up to 8 commands to the context menu of a computer item. EventSentry ships with a few default QuickTools commands, for example to reboot a remote machine. 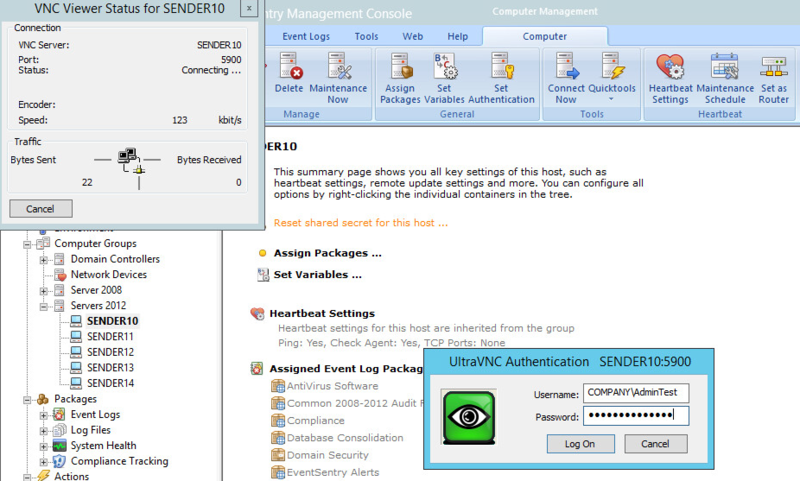 Once configured, you simply right-click a computer icon in the EventSentry Management console and select one of the pre-configured applications from the QuickTools sub menu. When you run the vnc_start.bat script, it will first check to see if UltraVNC is already installed on the remote host. If it is, it will skip the installation routine and bring up the local VNC viewer. If you configured the script to automatically stop the VNC service when not in use, it will start the service beforehand. When you disconnect, it will (optionally) stop the VNC service again so that VNC is not accessible remotely anymore. If VNC is not installed, the script will remotely install & configure UltraVNC using psexec. If you do not want to leave the UltraVNC service installed on the remote computer, the vnc_uninstall.bat script can be run when the remote session is done. Automatically stopping the remote VNC service is however sufficient in most cases. The scripts need to be configured before they can be used in your environment, unless you are an EventSentry user, in which case you only need to download & install the prerequisites. Get psexec.exe and save it in C:\Program Files (x86)\EventSentry\resources. Download the UltraVNC installers (they have 32-bit and 64-bit – download for the platforms you have on your network) and store them in the C:\Program Files (x86)\EventSentry\scripts\ultravnc folder. Install UltraVNC on the computer where EventSentry is installed so that the VNC Viewer is available. It’s not necessary to install the whole package, only the viewer component is required. If “VNC” is not listed in your QuickTools menu, then you will need to add it under Tools->Options->QuickTools. Simply enter “VNC” as the description and specify the path to the vnc_start utility, e.g. “C:\Program Files (x86)\EventSentry\scripts\ultravnc\vnc_start.bat $COMPUTER”. You can optionally check the “Hide” box to prevent the script output from being shown before you connect. You’ll notice that no password was configured – that’s because you will be logging in with a Windows user and password – only allowing domain admins access by default. This can be configured in the authorized_acl.inf file, if you want to give additional groups and/or users access that are not domain admins. That’s literally it – easy as pie. Even though we designed this thing to be easy peasy, since things do occasionally go wrong I recommend testing a first connection from the command line. Just open an administrative command prompt, navigate to C:\Program Files (x86)\EventSentry\scripts\ultravnc and type vnc_start somehost. Now just right-click any host – or use the “Quicktools” button in the ribbon – and select the “VNC” menu option. Keep in mind that first-time connections will take longer since the VNC setup file has to be copied and installed on the remote computer. Subsequent connections should be faster. So you are not an EventSentry user but still want to utilize these awesome scripts? No problem – we won’t hold it against you. The setup is still easy – you’ll just need to customize a few variables in the variables.bat file. Download the package from here. Create a local folder for this project, e.g. C:\Deployment\UltraVNC. Open the file variables.bat in a text editor and keep it open as you will be making a few modifications to this file. In variables.bat, set the VNCSOURCE variable to the directory you just created. Download the latest version of both the 32-bit and 64-bit UltraVNC installers. In variables.bat, set the VNCSETUP_X86 and VNCSETUP_X64 to the setup file names you just downloaded. Download the PSTools and extract psexec.exe into the working directory, or a directory of your choice. In variables.bat, point the PSEXECFILE variable to the location where you just saved psexec.exe. Optional: Edit the authorized_acl.inf file to specify which Windows group or user will have access to VNC. You can either change the first line, or add additional lines to give additional users and/or groups permission. Install the respective version of UltraVNC on your workstation so that the VNC Viewer is available. Open a command line window and navigate to the folder to which VNCSOURCE points to. Test the setup by running vnc_start hostname, replacing “hostname” with an actual host name of a remote host of course. When presented with the login screen of the VncViewer, log in with a Windows domain admin user. VNCSETUP_X86: The file name of the 32-bit installer. This needs to only be changed whenever UltraVNC comes out with a new version. VNCSETUP_X64: The file name of the 64-bit installer. This needs to only be changed whenever UltraVNC comes out with a new version. REMOTEINSTALLPATH: The directory where the script files will be copied to on the remote host. VNCSOURCE: This is the folder where all the vnc-related files, including the setup executables, are located on the source host from where you initiate VNC connections – e.g. C:\Deployment\UltraVNC. 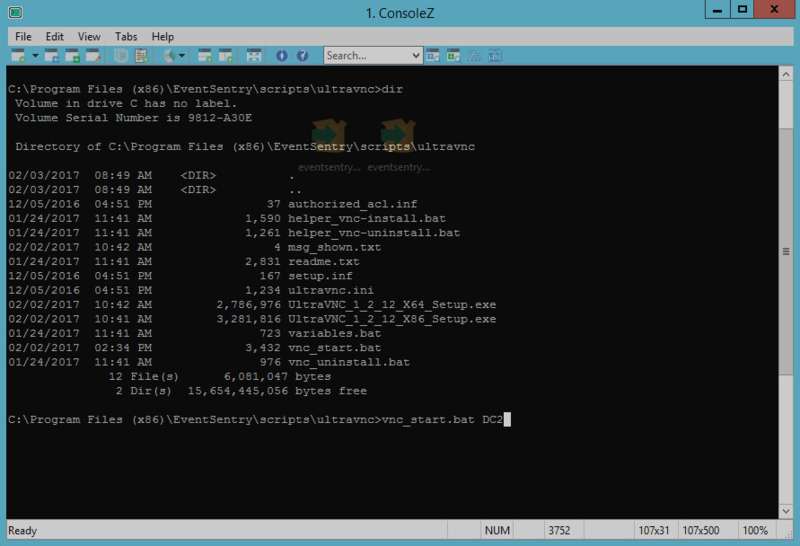 VNCINSTALLDIR: The directory in which UltraVNC will be installed in (on the remote hosts). VNCPASSWORD: This variable is not currently used since UltraVNC is automatically configured to authenticate against Windows, by default giving only Domain Admins access to VNC. This is generally more secure than using a password. You can edit the file authorized_acl.inf to give additional users and/or groups access to VNC. The file supports one ACL entry per line. PSEXECFILE: Unfortunately we are not allowed to bundle the nifty psexec.exe file for license reasons, so you’ll have to download the PsTools and point this variable to wherever you end up copying the psexec.exe file to. If you already have psexec.exe installed then you can save yourself 2 minutes of time and just specify the path to the existing file here. SET_VNC_SVC_TO_MANUAL: If you don’t entirely trust the security of VNC, maybe because you know what a brute force attack is, and you only want administrators to access VNC then you can set this variable to 1. As long as you only connect to the remote host(s) using the vnc_install.bat script, the scripts will ensure that the remote VNC service is started before you connect and stopped after you disconnect. Between the two of us, I’d always leave this set to 1 unless you have the desire to launch the VNC Viewer directly, or need non-administrators to be able to connect to the remote host(s). ADD_FIREWALL_RULE: As the name (almost) implies, this will create a firewall exclusion rule on the remote host(s) if you’ve been doing your homework and enabled the Windows firewall. If you don’t like our boring firewall rule name then you can even change the name below by editing the FW_RULE_NAME variable. Enabling this is usually not necessary since the UltraVNC setup adds firewall exclusion rules by default. VNCVIEWER: If you find that a different version of the VNC viewer works better than the version which we are shipping, then you can change the file name here. In my previous post I talked about our new NetFlow component as well as the new agent management capabilities now available in EventSentry v3.3. In this post I’ll cover the remaining new features and improvements we’ve made in v3.3, starting with the web reports. 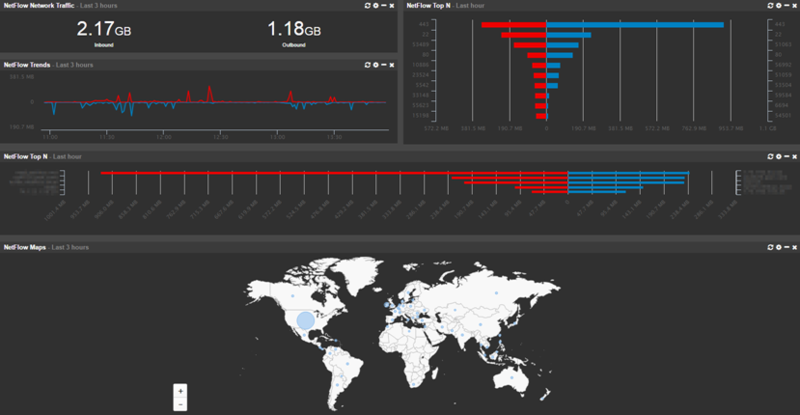 There are a number of new features and improvements in addition to NetFlow visualization. There are a few new dashboard tiles, including a “Recent Activity” tile which – as the name implies – shows recent relevant changes such as newly detected processes, software (un)installed, ping status or service status changes. Anybody who works in a team of two or more Sysadmins should find the new notes feature incredibly helpful. It lets any web reports user add comments (=notes) which are subsequently visible to others. Notes can be associated with one or more hosts (ensuring they show up in the “Documentation” tab of the respective host status page) and can include documents as attachments as well! Do you have warranty documents or network diagrams you want to store in a central place – easily accessible? That’s what the notes are for. The overall look and feel has also been refreshed, and we’ve reorganized the menu to make it faster to access dashboards and easier to find pages. 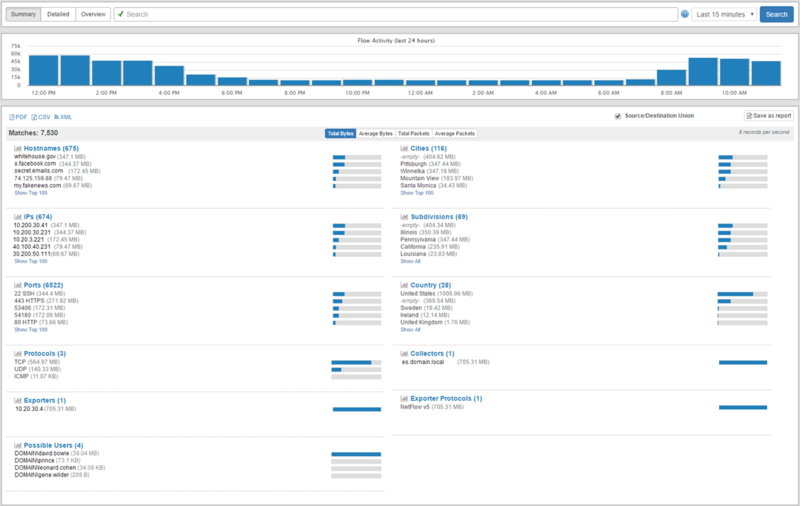 The visualization of data has been improved, since some chart types work better with certain features of EventSentry. You can now visualize grouped data using either pie charts, tree maps or column charts. The security of the web reports has also improved with a lockout policy which will locking an account after too many unsuccessful logon events. As mentioned in part 1, the EventSentry is agent is now available in 64-bit, making it possible to monitor 64-bit counters and easier to monitor files in 64-bit directories. For users upgrading from an earlier version, the EventSentry management console will automatically migrate any existing 32-bit agents on 64-bit versions of Windows. 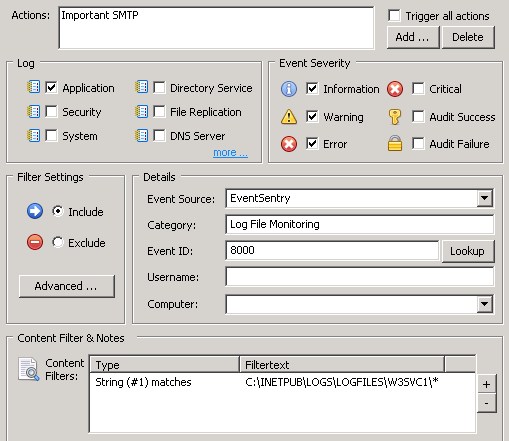 While monitoring Application & Services event logs, often referred to as “custom” event logs was possible, the way this needed to be configured in the management console was a common source of confusion. Some users also needed the ability to monitor more than 30 different logs. Consequently, monitoring additional event logs is now straightforward, and users can monitor as many event logs as they wish. With thresholds, timers, schedules, insertion strings, EventSentry already offers a sophisticated engine for monitoring events in real time. New in this release is the ability to setup filter chaining. This makes it possible to trigger actions only when 2 or more events occur, and you can even link events together using insertion strings. Chaining is enabled on the package level, and every filter in a “chaining” package is automatically part of the filter chaining rules. It happens frequently that we get alerts that require us to do additional research based on the information provided in the alert. For example, we may get an alert about an IP address for which we then need to do a reverse lookup or find the geoip location. Audit Success & Failure events from the security event log are another example, and often contain error codes and numbers which are not explained. Please note that (1) and (2) are only supported for emails sent through the collector since it requires access to a local geoip database. (1) and (2) will need to be enabled in the email action “Options”, (3) is automatically enabled for all emails. By making insertion strings from events accessible in filters and actions (e.g. through the $STR1, $STR2, … variables), it’s possible to create highly granular thresholds, customize emails, easily trigger corrective actions which utilize content from events and more. Based on our own requirements we took this capability a step further however, and you can now apply regex filters to events to define your own insertion strings. This is particularly useful for alerts which don’t use insertion strings or for events which contain log data. For those types of events, you can now parse parts of log strings and assign them to insertion strings. The previous blog article, Detecting Web Server Scan in Real-Time, shows a practical example of how to apply this new feature. 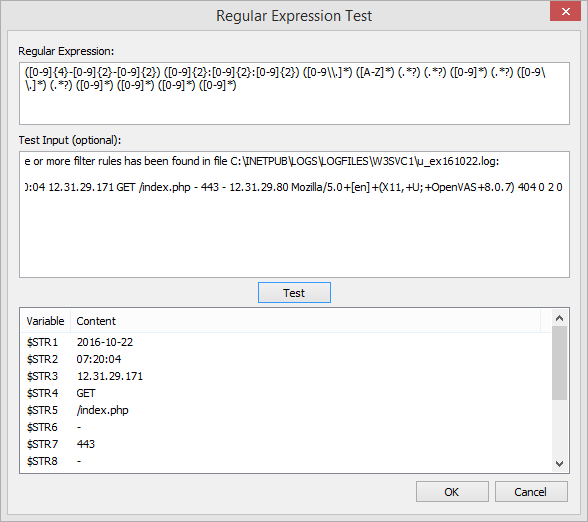 It does require you to be a bit familiar with Regular Expressions, but the management console includes a handy dialog where you can test your regular expressions, shown below. The heartbeat agent now relies less on RPC-based agent status monitoring and can instead obtain the status of a remote agent either directly from the collector or the database, resulting in less network traffic and faster heartbeat monitoring cycles. With new features & improvements in a variety of areas, this release should contain improvements for everyone. Remember that you can also submit feature requests here. We are very excited to release EventSentry v3.3, a major update to our award-winning monitoring solution EventSentry, less than 10 months after the release of the previous major version 3.2. Version 3.2 included the collector component which supports secure and reliable communication with remote agents as well as better database throughput, switch port mapping and many improvements to the web reports. I’d like to also thank everyone who took the time to fill out our annual survey – we read every single response in detail. If you haven’t taken it yet then you can still do so here. Visualize, measure & investigate network traffic better with the new NetFlow component – with discounted introductory pricing until 12/31 2016! Spend less time managing agents – the collector can now push configuration as well as agent updates automagically – think laptops! With a brand new component and many new features in a variety of areas, v3.3 will have something of interest for everyone. Let’s dive in and look at the new features in more detail. NetFlow is a new component which is part of the “Network Services” service (along with Syslog, SNMP, ARP) and is licensed separately. Pricing is very competitive and an additional introductory discount will be available until the end of this year, 12/31 – including competitive upgrades. You can request a quote here. EventSentry v3.3 currently supports the NetFlow v1, v5, v9 as well as sFlow flow protocols. NetFlow is usually supported by most commercial routers and firewalls whereas sFlow is most commonly supported by switches. NetFlow is generally preferable over sFlow – especially for forensic analysis since sFlow samples traffic and only sends every nth flow. sFlow can be preferable when dealing with large amounts of data, but EventSentry’s NetFlow implementation (as well as NetFlow itself) has a way to group flows and therefor condense traffic. On the EventSentry side, setting up NetFlow should take less than 5 minutes; and setting it up on the network device side is generally just a matter of enabling NetFlow and pointing it to EventSentry. EventSentry ships with the GeoLite geo database from MaxMind which does a good job of associating IP addresses with physical locations down to the city level. If you are looking for more accuracy however, then you can also purchase the full geo location database from MaxMind here. A unique feature of EventSentry’s NetFlow implementation is the ability to correlate workstation logins with network traffic, making it possible to associate network traffic with individual users. This requires that workstations are monitored with EventSentry and works best when users have a dedicated workstation. If you are utilizing the collector service then you have now a great time-saving feature available. Pushing a configuration update to remote hosts after you made a change or deploying agent updates after a patch installation are a thing of the past once you activate the respective options in the collector dialog. Managing automatic configuration updates can be done in 2 ways: Either by automatically deploying a configuration update after you click “save”, or by deploying only approved configuration updates (recommended). If you select the latter, then you just have to click the new “Save & Deploy” sub-option on the ribbon and the collector will do the rest. It’s no longer necessary that the EventSentry agent is directly reachable from the management console; it will receive the latest configuration as soon as it connects to the collector. Please note that you will still need to manually deploy a v3.3 agent once in order for automatic agent updates to work, since the self-update code is embedded in the new agents. Creating MSI files has also been greatly simplified – a x86 and x64 agent MSI file is created with just a few mouse button clicks. Manually editing MSI files with tools like ORCA is a thing of the past. The only prerequisite is the (free) WiX Toolset which has to be installed only once. In addition to saving most EventSentry users a lot of time, these new deployment features also make it possible to monitor laptops which aren’t permanently connected to the network. Simply deploy the agent MSI file with your favorite deployment tool (or deploy with the management console) and enable the configuration and agent management options in the collector. From that point on, any agent connecting to the collector will automatically receive the latest configuration AND any new agent updates – completely automatically – no matter where in the world they are located. Please note that EventSentry has not completely migrated to 64-bit yet, some components (management console, heartbeat agent, web reports) are still shipped as 32 bit executables. We plan on migrating all components to 64-bit by the end of 2017. There are just too many new features in v3.3 to fit them all into one blog post, so stay tuned for part 2 which will follow shortly. Any web site exposed to the Internet is constantly being probed by bots, malicious hackers and other evildoers in an attempt to take over the machine, gain access to unauthorized data, install back doors and so forth. Detecting probing attempts as early as possible and taking corrective action as soon possible is key to maintaining a secure network. Manual probing usually involves investigating the HTTP headers to determine the type of web server (e.g. IIS, Apache, Nginx), viewing HTML sources and possibly attempt to access well-known pages in order to determine whether any well-known web-based software (WordPress, CRM, OWA, …) is installed. If the attacker prefers the sledgehammer approach then he or she may also point a vulnerability scanner such as OpenVAS at the web server, which will reveal vulnerabilities with a minimum amount of work. Automated systems aren’t as surgical and will usually just look for specific vulnerabilities by checking for the existence of various URLs on the web server. But whether it’s a manual probe, a vulnerability scan or a bot, all methods usually result in a non-existent page (URL) being attempted to be accessed, resulting in a “Page Not Found”, 404 error at some point. As such, a larger than usual amount of 404 errors can be a good indicator that suspicious activity is occurring on your web server. If you are a little paranoid like me then you could even look for every single 404 error that occurs on your web server. The same technique can be applied to other errors as well, such as “Access Denied” errors for example if the web site is secured by ACLs. 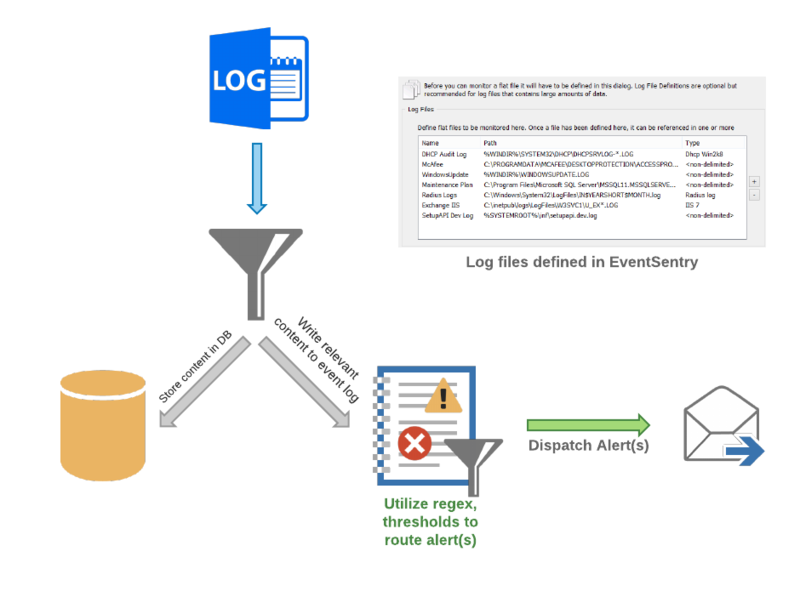 EventSentry’s log file monitoring feature can monitor Windows-based log files in real time and trigger alerts and/or corrective actions by applying sophisticated rulesets to all parsed text. I’ll explain how this can be setup based on an IIS web server, but the same generic steps would apply to other web servers as well. 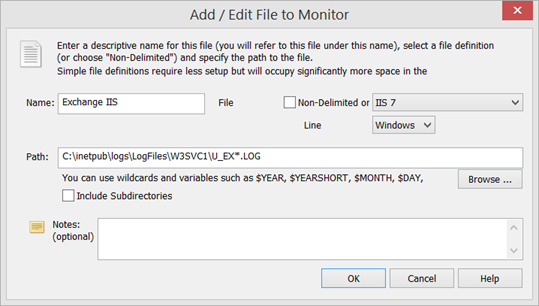 If you plan on storing contents in the EventSentry database as well then you can also select a matching log file definition (such as IIS 7) as the log file type. 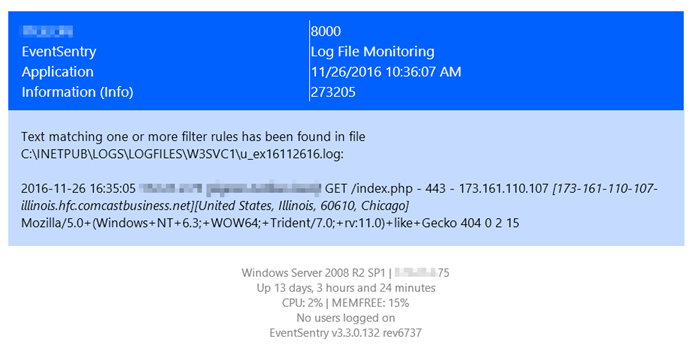 More information on log file types can be found in our IIS Log File Monitoring with EventSentry screen cast. 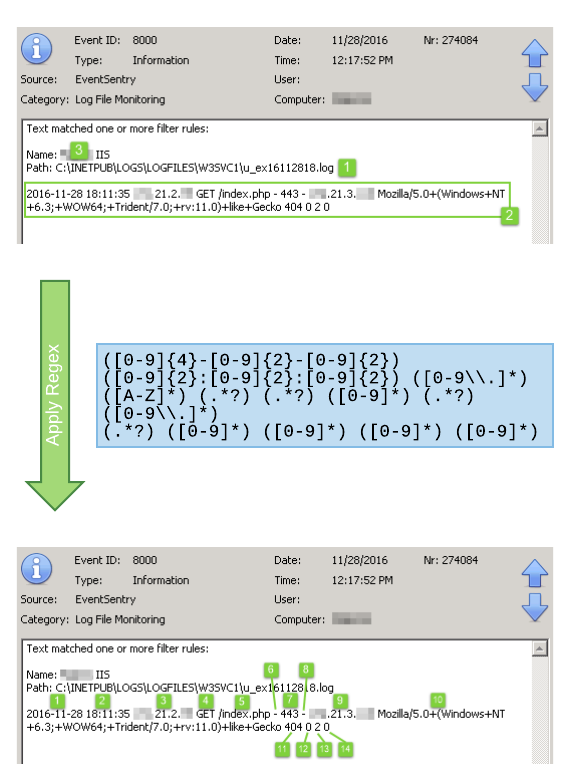 A log file filter defines where content from the log file is routed to. In this example we’ll route 404 errors to the Application event log. Using the ribbon again, and while still in the log file context, click on “Add Package” on the top left to create a new package – give the package a descriptive name. Then, click the “Assign” button to assign this package globally, to a group or individual host. (remember that you can also assign packages dynamically). Now click “Add” in the “Log File” section to add the previously configured log file to the package. In the resulting dialog we can configure the log file filter to send log file contents to the database, the event log or both. For the purpose of this example we will only log certain lines of the log file to the event log – those matching the wildcard filter * 404* (note the space between the first * and 404) as shown in the screenshot above. You can also use a regex expression for a more sophisticated match type. That’s all that is required to trigger an email or process every time a 404 error is triggered on your web server. Read on to refine this setup and only get alerted when the same remote IP address triggers a certain number of 404 errors within a certain time period – fun! Owasp.org is a great resource for web developers which provides a plethora of information to help keep web sites secure. The Owasp Top 10 document illustrates what the most critical web application security flaws are. 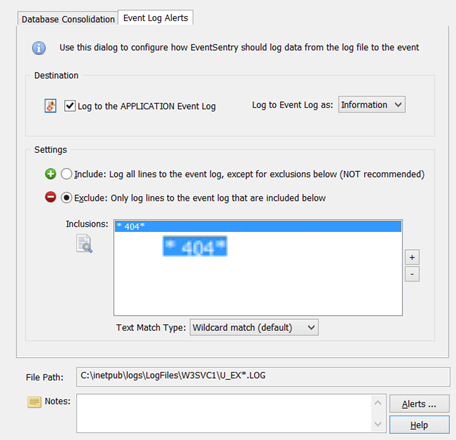 Getting alerts whenever specific text – like a 404 error – are logged is quite useful, but utilizing EventSentry’s advanced event log filter & thresholds features can reduce noise and make monitoring log file contents even more actionable. 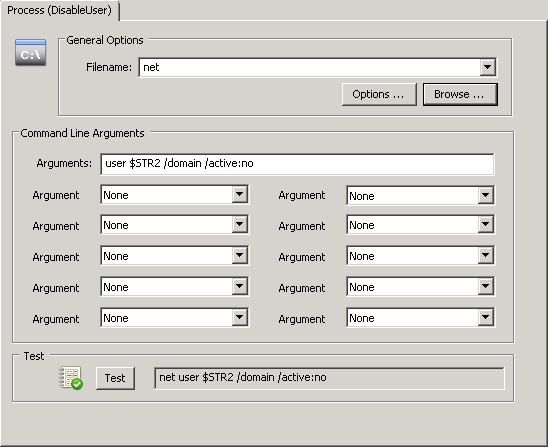 Regular expressions are set using the “Advanced” button on the “Generic” tab of an event log filter. In the advanced dialog, simply click “Edit” in the “Insertion String Override” section. This is possible with the redefined insertion strings, since #9 (=$STR9) is the remote host’s IP address. To set a custom subject, click the “Advanced” button on the “Generic” tab of an event log filter. By default, threshold counters are increased every time an event matches the corresponding filter. To stick with our example here, we could configure EventSentry to let us know if more than three 404 errors occur within 5 minutes. But we’d essentially be throwing all events into the same bucket. If you look at it in detail however, you realize that it makes a difference whether three 404 errors are a result of activity from the same remote host, or three different remote hosts. Since events are often a result of specific activity by something or somebody, it’s important that we can correlate multiple events. In our example, the “something” is the remote host, which is represented by insertion string $STR9. As such, we can configure our threshold to use $STR9 as the common identifier, and create unique thresholds based on the run-time value of $STR9. By doing that, we will trip the threshold only if the same remote host accesses a non-existing URL three times, but not if three different remote hosts only access one non-existent URL each. The same technique can be applied to thresholds for failed logon events. It’s usually acceptable if a user types the wrong password a few times, but a large number of failed logons from the same user are not. Just applying a threshold to all 4625 events is usually not practicable since many users occasionally type a wrong password. But by tying the threshold to the insertion string representing the user name (they are 6 & 7 in case you are curious), we can create a separate threshold for every user and avoid false positives. Since Ransomware is still all the rage – literally – I decided to write a 4th article with a potentially better method to stop an ongoing infection. In part 1, part 2 and part 3 we focused mostly on detecting an ongoing Ransomware infection and utilized the “nuclear” option to prevent it from spreading: stopping the “server” service which would prevent any client from accessing files on the affected server. While these methods are certainly effective, there are other more targeted steps you can take instead of or in addition to shutting down the server service, provided that all hosts susceptible to a Ransomware infection are monitored by EventSentry. When EventSentry detects an ongoing Ransomware infection, it can usually determine the infected user by extracting the domain user name from the 4663 event. Simply disabling the user is insufficient however, since a disabled user can continue to access the network (and wreak havoc) as long as he or she doesn’t log off. Any subsequent log on attempt would of course fail, but that provides little comfort when the user’s computer continues to plow through hundreds or thousands of documents, relentlessly encrypting everything in its path. As such, the only reliable way to stop the ongoing infection, given only the user name, is to log off the user. While logging a user off remotely is possible using the query session and logoff.exe commands, I prefer to completely shut down the offending computer in order to reduce the risk of any future malicious activity. Logging the user off remotely may still be preferable in a terminal server environment (let me know if you want me to cover this in a future article). Knowing the user name is of course great, but how do we find out which computer he or she is logged on to? If you have EventSentry deployed across your entire network – including workstations – then you can get this info by querying the console logon reports in the EventSentry web reports. If you are not so lucky to have EventSentry deployed in your entire environment (we offer significant discounts for large quantities of workstation licenses – you can request a quote here) then we can still obtain this information from the “net session” command in Windows. The script uses only built-in Windows commands, as such there is no need to install anything else on the server where it’s run. 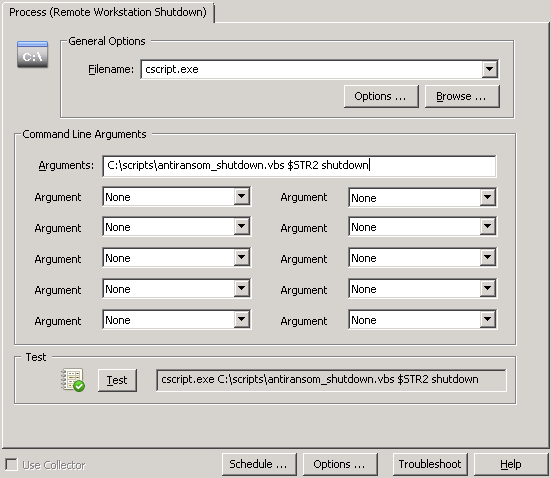 When executed with the “shutdown” parameter, the script will issue a shutdown command to the remote host, which will display a (customizable) warning message to the user indicating that the computer is being shutdown because of a potential infection. The timeout is 5 seconds by default but can be customized in the script. It’s recommended to keep the timeout short (5-10 seconds) in order to neutralize the threat as quickly as possible while still giving the user a few moments to know what is happening. The overall setup of the Ransomware detection is still the same, we’re setting up a threshold filter to detect a higher than usual frequency of certain 4663 events and trigger an action in response. Only this time we don’t shut down the server service, but instead trigger this script. To properly execute the action, configure it as shown in the screenshot below. The executable is cscript.exe (the interpreter for .vbs files) and the command line parameters are the name of the script, $STR2 and “shutdown”. This ends up being one of those “it depends” situations where you will have to decide what’s the best approach based on your environment. I would personally go with the remote workstation shutdown option in large networks where the vast majority of workstations are desktops reachable (and not firewalled) from the file server. In smaller, more distributed networks with a lot of laptops, I would go with the file service shutdown “nuclear” option. A hybrid approach may also be an option for those opting for the remote workstation shutdown method: trigger a remote workstation shutdown during business hours when IT staff is available on short notice, but configure the file service shutdown after business hours when it’s safer and affects fewer people. All this can be configured in EventSentry by creating two filters which are identical except for the action and the day/time settings. Change the service account (fast): Changing the service account the EventSentry service uses to a domain account with administrative permissions will allow the agent to remotely shut down a remote host. This will have to be done on every file server which may issue shut down commands (you can use AutoAdministrator to update multiple file servers if necessary). 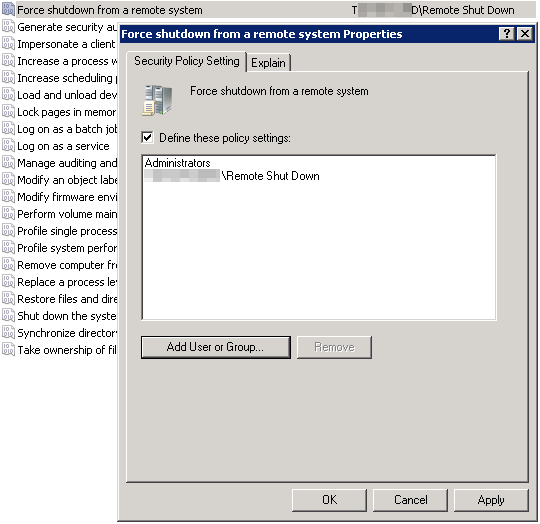 d) Double-click the “Force shutdown from a remote system” user right and add both “Administrators” and the computer accounts of the file servers to the list. Alternatively you can also create a group, add the file servers to the group, and add that group to the policy (keep in mind that you will need to restart the file servers if you go with the group method). Once the group policy setting has propagated to the workstations, the remote shut down initiated from the file server(s) should succeed. Good luck protecting your network against Ransomware infections, also remember to verify your backups – no protection is 100% effective. Dashboards are a great way to visualize large amounts of information in a concise matter. In IT we usually display various types of network data from a monitoring software, but dashboards are used in all sorts of environments. You can visualize stock data or just show a map of all trucks in a fleet with their current position. If you work for a large company with a dedicated NOC then you’ll likely have an integrated setup with 4 or more TVs, connected to hardware specialized for dashboards or, at the very least, a powerful PC with multiple PCI cards. 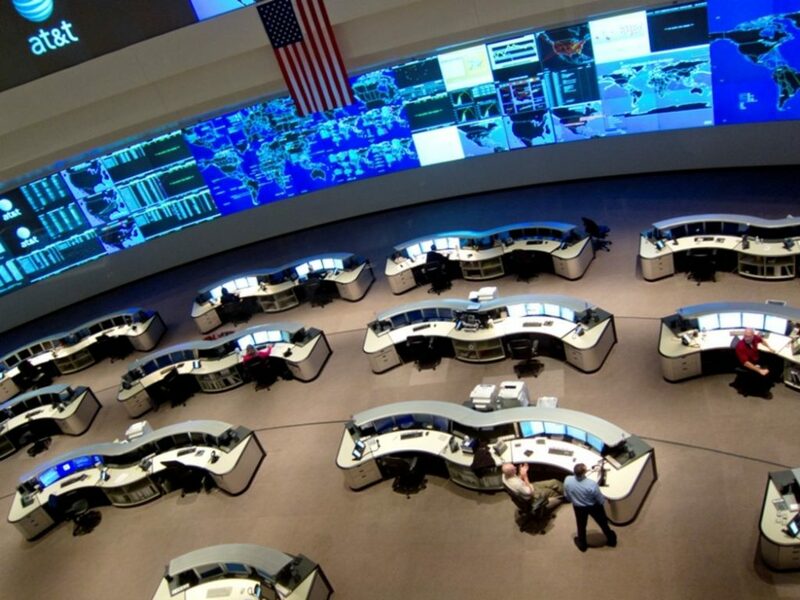 But not everybody has the budget or the need for a NOC like AT&Ts, and one or two TVs can be sufficient for most networks – provided the dashboard is well-designed and customizable of course. Most dashboards require a fairly recent web browser (if you are unlucky even Adobe Flash), making some sort of a PC or Mac the preferred hardware to power that dashboard. Most IT departments have a plethora of old PCs sitting around, and it can be tempting to resurrect one of those boxes and give them a new life as a dashboard PC. After all, you’re “just” displaying a web page. Low-cost integrated devices like the Raspberry Pi are tempting, but not perfect either. They’re not usually designed to be used with graphical interfaces, much less with memory and CPU hungry applications like web browsers displaying dashboards. After trying everything from Raspberry Pi, old Mac Mini hardware and more, we finally found a solution for under $100 – which has now worked quite well for several months: The 1st generation Intel Compute Stick which you can get from online retailers like Amazon, NewEgg and others. Even in its 1st generation (the one we tested) the Intel Compute Stick running Windows 10 Home performed surprisingly well. 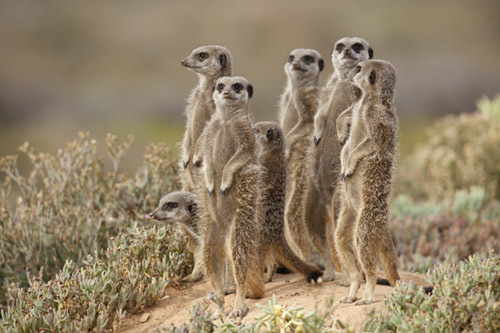 We’ve been running an EventSentry dashboard (which of course we’re hoping you are running as well) on it since February on Microsoft’s new Edge browser, and we’ve never had an issue. 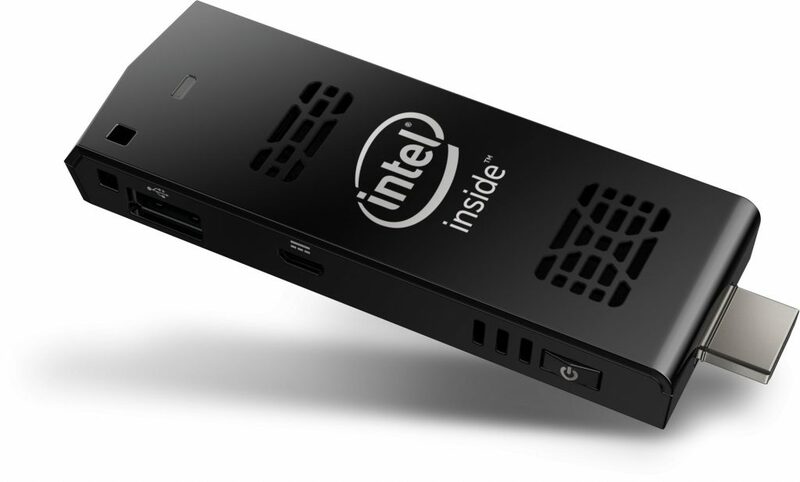 The Intel Compute Stick features 2 Gb of RAM, is powered by a quad-core intel Atom processor and has 30 Gb of storage, of which more than half are available. This is of course not a machine you’ll want to render videos or play video games on, but plenty sufficient for a web browser from our experience. We were actually pleasantly surprised by how responsive the little device felt overall. Even though you cannot join a domain, you can still install the EventSentry agent on the machine to keep an eye on performance and other system metrics for example. But there are of course some caveats, as is to be expected from a computer that costs less than $100 and is not much bigger than a USB memory stick. If you’re using Bluetooth and Wifi then you’ll only need to connect the power cord and the setup is clean. Since the stick also sports a single USB 2.0 port, we used a USB hub along with a USB-based Ethernet adapter to connect it to our LAN as well as connect a keyboard/mouse. USB 2.0 didn’t negatively affect performance in our limited use case scenario. If you need more hardware, maybe because your dashboards are particularly taxing, then you can purchase a newer and faster model as well. The 2nd generation Intel Computer Sticks start around $149 and the high-end models include as much as 64Gb of disk space and 4Gb of RAM. My first computer was a 80286 with 1Mb of RAM and a 20Mb hard drive, and it was about as big as two shoe boxes. It’s impressive to see a device this small perform that well. If you have the need to turn a TV into a full-blown desktop, then I’d definitely recommend the Intel Computer Stick(s)! Our latest patch for EventSentry v3.2 (v3.2.1.30) requires some additional information in addition to the release notes. By default, the EventSentry Heartbeat Monitor ensures that all remote agents are running by querying the status of the remote “EventSentry” service. While is an accurate way to ensure the remote agent is running, the Microsoft RPC mechanism isn’t very efficient when connecting to remote hosts across a slow (WAN) link, and concurrently checking the service status of 100+ hosts at the same time can on occasion also cause issues. In these situations, the heartbeat agent may not be able to monitor all hosts in the configured monitoring interval. Furthermore, querying the remote status of a service requires that the EventSentry Heartbeat Agent run under a domain account, otherwise the dreaded “Access Denied” error appears on the heartbeat status page in the web reports. To address these issues for larger EventSentry deployments (500+ hosts) and deployments where the remote agents are connected through a slower WAN link, we have added the ability to query the remote agent status through the EventSentry database where the remote agents periodically check in. This check is enabled by default for new installations, but existing installations will need to make a database permission change in order to give the heartbeat agent permission to query the agent status. More information can be found here. In the next release of EventSentry (v3.3), this functionality will be configurable, and the heartbeat agent will also be able to determine the current agent status by communicating directly with the collector service (when enabled) for even better accuracy. The Heartbeat Monitor will always attempt to revert back to the legacy method of checking the service status directly if it cannot obtain the status through other means. EventSentry distinguishes between three types of service changes: Status changes (e.g. 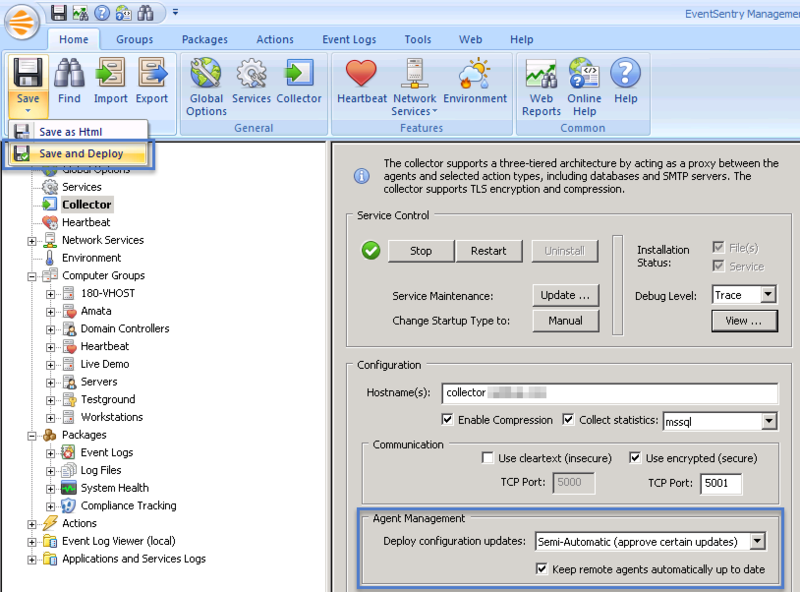 Running to Stopped), service configuration changes (e.g. changes to the startup type) and services being added or removed. Up until release 3.2.1.22, all status changes and service configuration changes were logged with the same event severity, which we didn’t think was very fitting since the status change of a service is very different to a change of the service itself. As such, starting with 3.2.1.30, only service status changes will be logged under the severity configured under “Monitor Service Status Changes” category. All other service changes will be logged under the severity configured under “Monitor Service Addition / Removal” category. The EventSentry QuickTools allow you to run an application/script against a server or workstation in your EventSentry configuration. EventSentry includes a few default QuickTools entries, such as “Reboot”, “Remote Desktop” and others. Starting with the latest release we added a new “Hide” option, which will not show the executed application on the desktop. This will be useful for integrating our upcoming VNC wrapper scripts (Blog article coming soon), which will allow you to install & launch a (Tiger)VNC client directly from the EventSentry management console. Starting with this release, EventSentry Light v3.2 will also be available. We have good news for all EventSentry Light users: We have increased the number of full hosts you can remotely manage to 5, and also increased the number of network devices you can monitor to 5. As such you can now monitor up to 10 hosts with EventSentry Light completely for free. There seems to be a new variant of ransomware popping up somewhere every few months (Locky being the most recent one), with every new variation targeting more users / computers / networks and circumventing protections put in place by the defenders for their previous counterparts. The whole thing has turned into a cat and mouse game, with an increasing number of software companies and SysAdmins attempting to come up with effective countermeasures. In the first article we configured file integrity monitoring on a volume, and if the number of file modifications occurring during a certain time interval exceeded a preset threshold, the ransomware would be stopped in its tracks. In the seconds article we used bait (canary) files to accomplish the same thing. Ransomware always runs in the context of a user, and as such an infection will usually come from one user (unless things go really awry and multiple users are infected). The approach here will work equally well, regardless of the number of infections. Thus, to detect an infection, EventSentry will be counting the number of file modifications (event 4663) with its advanced threshold capabilities. 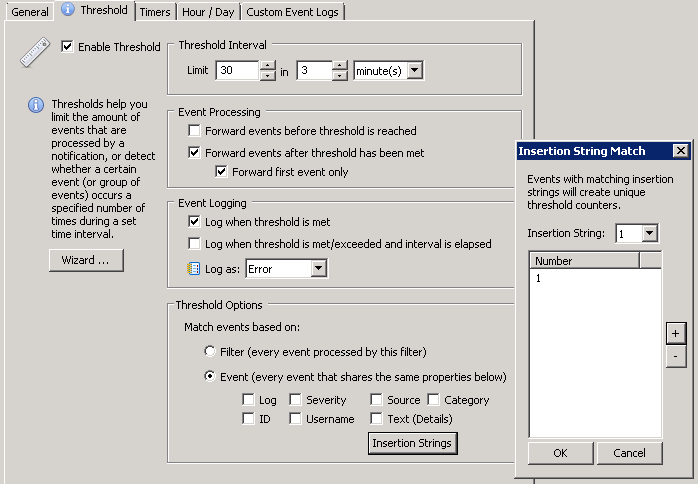 If the threshold is exceeded, EventSentry will trigger an action of your choice (e.g. disable the user, remove a file share, stop the server service, …) to limit the damage of the ransomware. 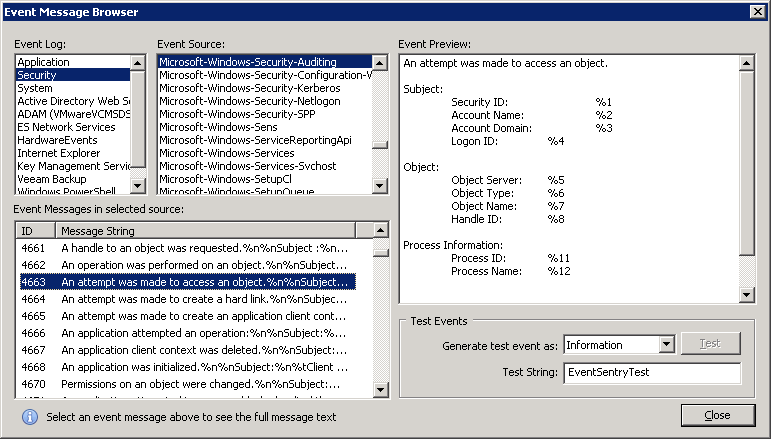 This KB article explains how to configure EventSentry and enable auditing (preferably through group policy) on one or more directories. I recommend referencing the KB article when you’re ready to configure everything. Pretty much everything in the KB article applies here, although we will make a small change to the threshold settings of the filter (last paragraph of section (4)). The default behavior of a filter threshold in EventSentry is to simply count every filter match towards the threshold. In our case, every 4663 event encountered would count towards the threshold. You can think of there being one bucket for all 4663 events, with the bucket being emptied whenever the threshold period expires, say every 5 minutes. If the bucket fills up we can trigger an alert. This doesn’t work so well on a file server, where potentially hundreds of users are constantly modifying files. It would take some time to come up with a good baseline (how many file modifications are considered “normal”) that we could use as a threshold, and there would still be a chance for a false positive. For example, a lot of 4663 events could be generated during a busy day at the office, thus causing the threshold to reach its limit. A better way is to assign each user their own “personal” threshold which we can then monitor. Think of it like each user having their own bucket. If a user writes to a file, EventSentry adds the 4663 event only to that user’s bucket. Subsequently, an alert is only triggered when a user’s bucket is full. Any insertion string of an event can be used to create a new bucket. We can do this by utilizing the insertion string capabilities of the filter threshold feature. 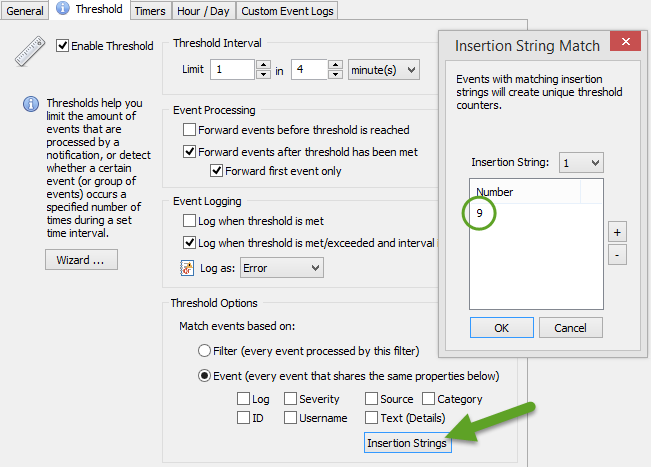 Setting this up is surprisingly easy – all we have to do is change the Threshold Options to “Event”, click the “Insertion Strings” button and select the correct insertion string. What is the correct insertion string? The short answer is #1. The long answer lies in the “Event Message Browser”, which you can either find through the Tools – Utilities menu in the EventSentry Management Console or in the EventSentry SysAdmin Tools. Once in there, click on “Security”, then “Microsoft-Windows-Security-Auditing”, then 4663. You will see that the number next to the field identifying the calling user (“Security ID”) is %1. 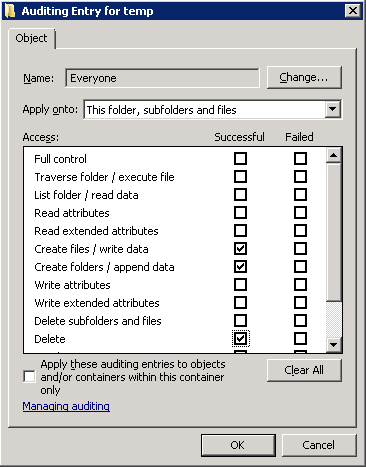 Enable global auditing globally and audit the file share(s). See section 2 & 3 of KB 279. Determine what action you want to take when a ransomware infection has been detected. See either section 1 of KB 279 or “Dive! Stopping the Server Service” from the previous blog post. Create a package & filter looking for 4663 events. See section 4 of KB 279 and review the additional threshold settings below. The interval shouldn’t be too long, otherwise it will take too long before the infection is detected. Make sure the actual event log filter is only looking at 4663 events, no other event ids. With the above example, any user modifying any file (on a given server) more than 30 times in 3 minutes will trigger any action associated with the filter, e.g. shutting down the server service. Note that the action listed in the General tab will be triggered as soon as the threshold is met. If 30 4663 events for a single user are generated within 45 seconds, the action will be triggered after 45 seconds, it won’t wait 3 minutes. Disabling a user is usually not enough though, since Windows won’t automatically disconnect the user or revoke access. As such, any ransom/crypto process already running will continue to run – even if the user has been disabled. That’s it, now just push the configuration and you should be much better prepared to take any ransomware attacks heading your users way. Oh, and check those backups, would you?